About six months ago I fell in love with pistachios. I was eating so many that my thumb got a blister on it from shelling so many. Note to self, buy the unshelled. But that seems like cheating. 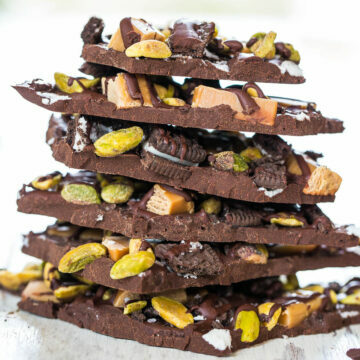 Unless you dump the pistachios onto melted dark chocolate along with caramels, Oreos, and sea salt. I love making bark because it’s fast, easy, foolproof, and you can use up your odds and ends. Anything from the last bits in a bag of pretzels to the remnants of the butterscotch chips to random Easter candy you found stashed away. Everything tastes better smorgasboard-style on top of bark. For the bark I used lightly salted pistachios, diced caramels, Oreos, and a sprinkling of sea salt for a salty-and-sweet effect. I love salty-and-sweet treats and I find that with dark chocolate, a pinch of salt goes a long way to enhance and round out the flavor. The chocolate is Trader Joe’s Dark Chocolate Pound Plus Bar. It melts so smoothly, evenly, and it’s dark enough without being bitter or too intense. It makes for a smooth, mellow, bark-eating experience. Use your favorite chocolate from uber dark to milk. The bark is a texture lover’s dream. 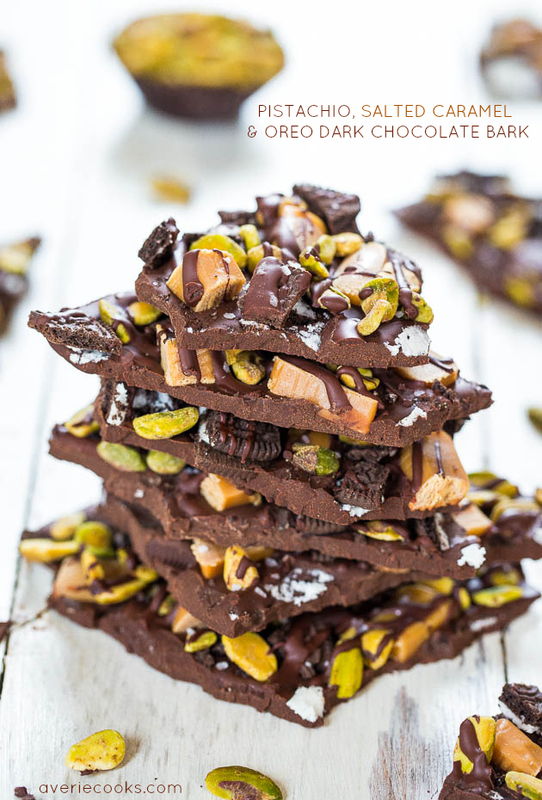 The smooth, rich chocolate that melts in your mouth contrasted with the slightly salty pistachios and crunchy Oreos. The caramels are buttery, creamy, and chewy. There are so many flavor and texture combinations in every bite and the more you eat, the more you want. I gave some of the bark away because it was far too dangerous to keep in my house. It makes great hostess gifts or gifts for friends, teachers, and neighbors. If you can manage to part with some or don’t eat it all first. Bark is fast, easy, foolproof, and you can add whatever odds and ends are lurking in your pantry and this bark is a texture lover’s dream. 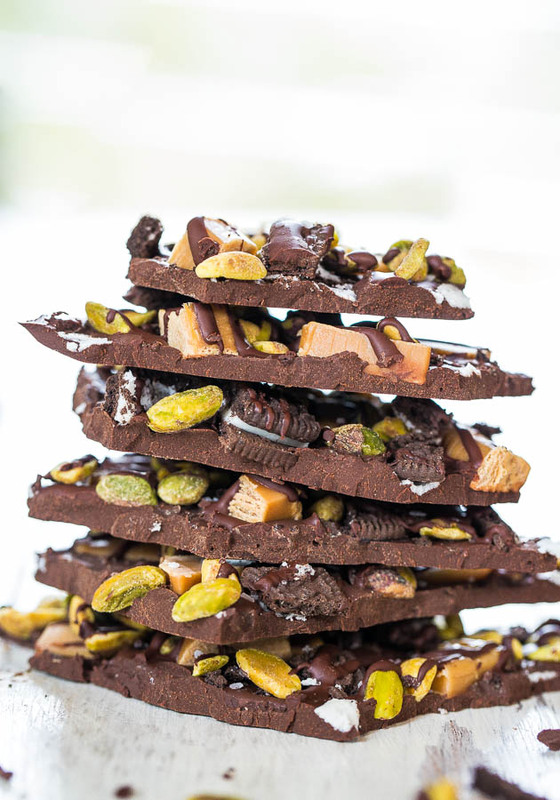 The smooth, rich chocolate that melts in your mouth is in contrast with the slightly salty pistachios and crunchy Oreos. 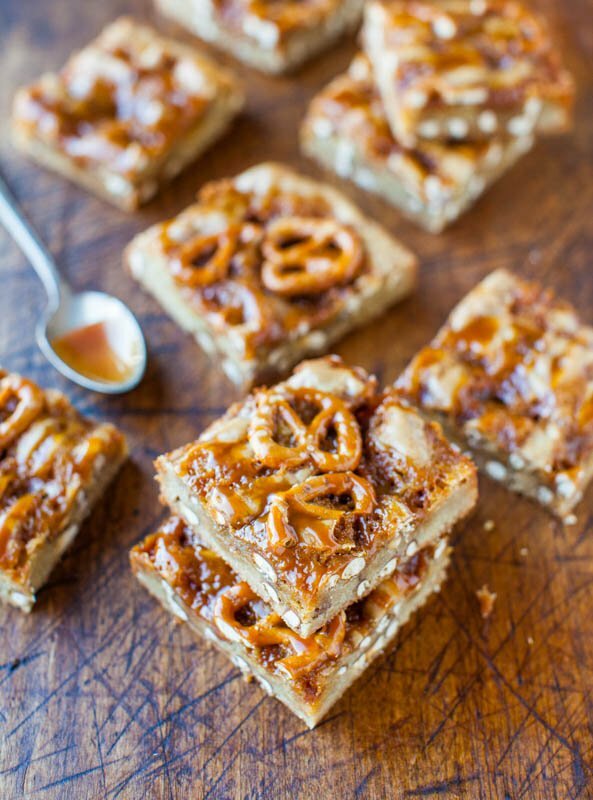 The caramels are buttery, creamy, and add chewiness. There are so many flavor and texture combinations in every bite and the more you eat, the more you want. 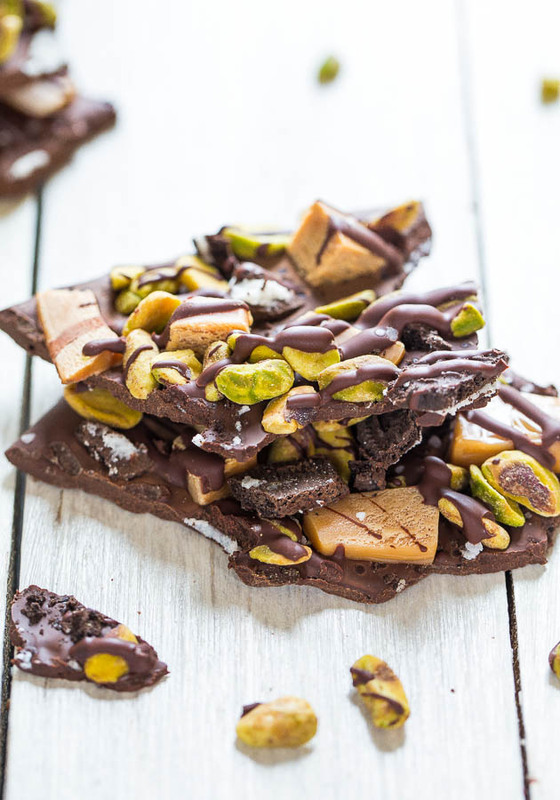 Customize the bark based on your favorite toppings and what you have on hand. It makes great hostess gifts or gifts for friends, teachers, and neighbors. Line a baking tray with parchment paper; set aside. Before beginning to melt the chocolate, have all the ingredients chopped, prepped, and ready to go so that they’re ready to be added while the chocolate is hot and melty. 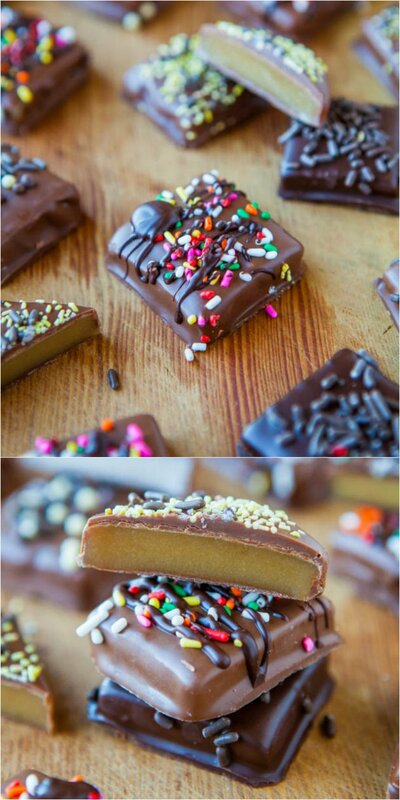 Coarsely chop the chocolate or break into chunks to encourage smooth melting. Place chocolate in a large microwave-safe bowl. Heat on high power to melt, about 2 to 3 minutes, stopping every 15 seconds to check and stir until it can be stirred smooth. Be careful not to scorch it; or use a double boiler. Pour melted chocolate onto parchment and with a spatula or offset knife, smooth into a large rectangle, about 10×15-inches, and about 1/8-inch thick; just eyeball. Reserve 1 to 2 tablespoons in the bottom of the bowl for final chocolate drizzle; set aside. 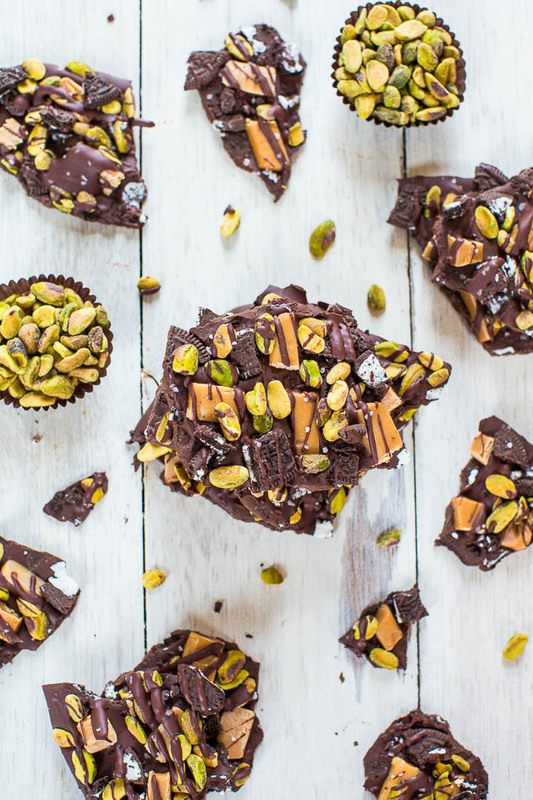 Evenly sprinkle with caramels, Oreos, pistachios, and sea salt to taste. 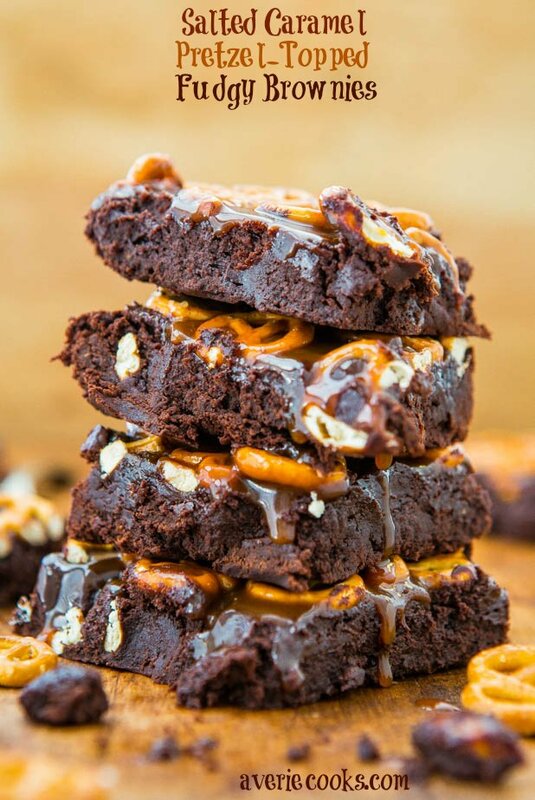 Evenly drizzle with reserved 1 to 2 tablespoons chocolate; optional but helps ‘glue’ the toppings down and adds visual appeal. Allow chocolate to set up for at least 3 hours at room temp, or in the freezer for about 30 minutes. After chocolate has set, break into pieces or chop with a knife. Bark will keep airtight at room temp for many weeks and in the fridge or freezer for many months. 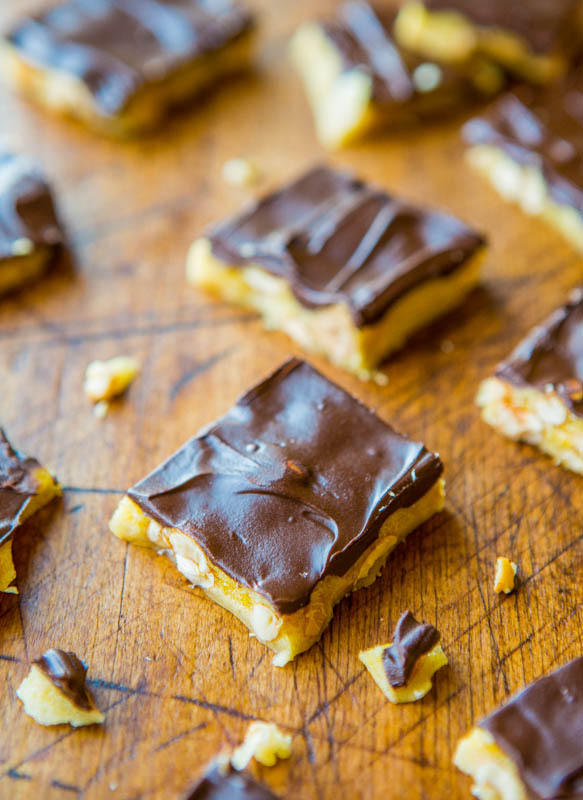 Chocolate Saltine Toffee (aka Christmas Crack) – Lives up to it’s name and is extremely addictive! 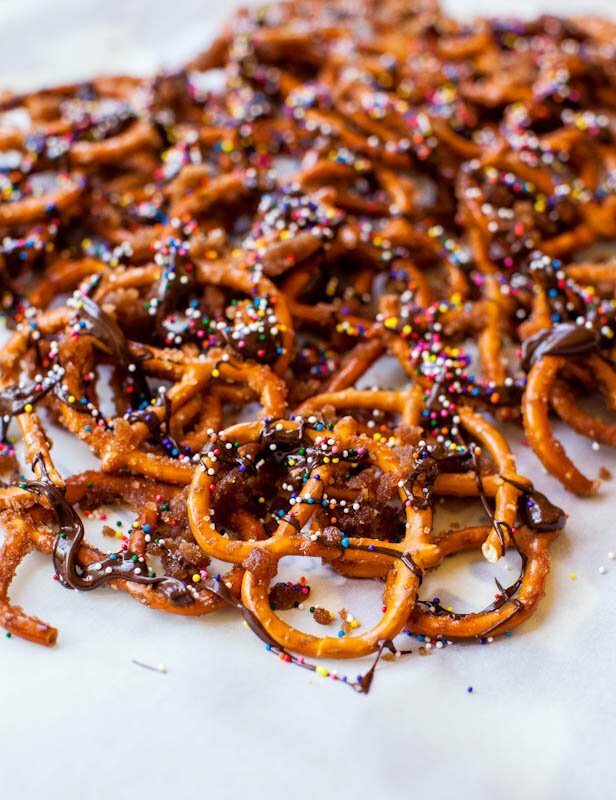 Salty, sweet, crunchy, chewy and a holiday favorite everyone loves! Pistachio + Dark Chocolate is a favorite combination of mine. Glad you discovered this delicious nut :)!